TS SBTET Diploma Time tables 2019: SBTET TS Diploma Time tables March/April 2019 are available at sbtet.telangana.gov.in. Candidates can download Telangana SBTET polytechnic time tables For C18, C16, C14, C09 & ER-91 Regular/Supply Exams. State Board of Technical Education & Training Telangana has announced the Diploma Examination timetable March/April 2019. Candidates who are eagerly waiting for TS SBTET Diploma timetable 2019 can download it from the Telangana SBTET official page, sbtet.telangana.gov.in. The Telangana SBTET Diploma Time tables For C18, C16, C14, C09 and ER91 has announced by Board. Candidates can hurry up to visit the official page and download the timetable. As per the scheduled timetable the Telangana SBTET Diploma examinations will be scheduled to conduct from 22-03-2019. Candidates who are presently pursuing the Diploma under SBTET can check the clear details of examination dates from the SBTET official website, sbtet.telangana.gov.in. Scroll the article for more information. Check TS SBTET Diploma Date Sheet: The Telangana SBTET Diploma March/April Timetable 2019 has been announced for regular and supply examinations. The TS SBTET Diploma Date sheet 2019 for March/April has announced for Bio-Medical Engineering: BM, Communication Engineering: CN, Computer Engineering: CP, Industrial Electronic Engineering: IE, TV & Sound Engineering: TV, Mechanical Engineering, Civil, Electrical, Electronics and various other branches. Hopefuls can check the Telangana SBTET Diploma C09, C14, C16, C18, ER91 Date sheet 2019 from the SBTET website. Also aspirants can download the TS SBTET Diploma hall ticket 2019 before 2 weeks of the examinations. With reference to the subject cited above, you are already aware of the Tentative Time Table being communicated vide Ref.01, in this regard the Final Time Table of the Board Diploma Regular Examinations of Even Semesters of C-18, C-I 6, C-16S & ER-91 schemes and Backlog examinations of C-09, C-14,C-16, C-16S & ER- 91-schemes are scheduled to commence from 22-03-2019 and 15- 03-2019 respectively is now forwarded. Therefore you are requested to verify the schedule for Time-Table of Board Diploma Regular Examinations of Even Semesters of C-18, C-16, C-16S & ER-91 schemes and Backlog examinations of C-09, C-14, C-16, C-16S & ER- 91-schemes are enclosed here with for wide spread propaganda among staff and students, the C-18 Scheme Regular Examinations will be conducted successively while C-16 & C-16S regular exams are spaced alternately by placing backlog subjects after every regular exam. If any discrepancies are found, the same shall be brought to the notice of the “Deputy Secretary, EE-II Section in the Board through mail to dysecy2-sbtet@telangana.gov.in” immediately for taking necessary action. The above schedule of time-table is also placed in the website, www.sbtet.telangana.gov.in under Notifications link. Hence the Principals are requested to bestow their personal attention to take utmost care in this regard. 1. A/AA/C/CCP/CH/CM/EC/EE/EIE/FW/GT/HMCT/HS/M/MET/MNG/PKG/TT, C-18 I, II Scm. 2. A/ AA/ AEI/C/ CM/CCP/CT/EC/EE/ GT/HS/HMCT/ IT/ M/ MNG/PKG/CH/ CHST/ MET/ IT C-16s 3rd Sem. 3. A/AA/C/CCP/CHST/CM/CT/EC/EE//EIE/FW/GT/HMCT/HS/IT/M/MNG/PKG/ C-16 V Sem. 4. CH/MET/IT, C-14 VII Sem. 5. A/ AA/AEI/C/CM/CCP/CT/EC/EE/GT/HS/HMCT/IT/M/MNG/PKG/CH/CHST/MET/ 1st TI/FW-C-16 semester. 9. A/ AA /C/ CIYl/CCP/CT/CH/ CHST/ EC/EE/ EI/ FW/GT/HS/HMCT/ IT/ M/ MNG/PKG/ M TI C-16 IV Semester. 13. FW I Year and IV, V &VI semesters of C-14 Scheme. 14. AA, CHST, HMCT I, III, IV&VI semesters of C-14 Scheme. 15. A/ AA/ AEI/C/ CM/CCP/EC/EE/ GT/HMCT/ IT/ M/ MNG/PKG/ CHST -I Year and III, IV and VI Semesters of C-09 Scheme. 16. FW I Year, IV, V and VII Semesters of C-09 Scheme. 17. CT/HS -I Year and III, IV, V & VI Semesters of C-09 Scheme. The C-18 Semester end examinations time duration is changed to 2 hours instead of 3 hours as the no. & size of questions is reduced. NOTE: The Practical exams will be conducted on the dates notified by the principal. Look for the examination -> Time tables section on the homepage. 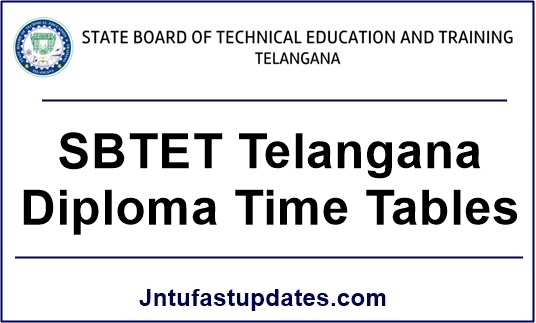 The Telangana SBTET Diploma Time tables 2019 Link will be enabled before 2 weeks of the examinations. The TS SBTET Diploma Timetables 2019 PDF is going to be downloaded on screen. Aspirants are requested to download and preserve the SBTET Diploma hall ticket 2019 to attempt the examinations. Candidates will not be permitted to attempt examinations without showing the hall ticket at the time of verification. Candidates can check the details of their examination venue, dates, timings of examinations. And also the name of the candidate, scanned photograph, father’s name, signature etc details of candidates will be seen on admit card. All the candidates attempting the TS SBTET Diploma (C09, C14, C16, ER91) Regular/Supply examinations 2019 can download and check their hall tickets clearly to know the exam dates and other information. Check the following process to download TS SBTET Diploma admit card 2019. Sir please conduct c-16 5th sem supply exams . otherwise it makes a great loss for the students who are good at studies but absent for the exams due to family reasons like me.This is my humble request to you sir plzz. Sir c14 oct/nov 2018 lo conduct chesina exams lo konni exams malli pedutaru annaru kada eppudu pedutaru sir please one week mundu maaku time tabel release cheyandi pls pls pls …..
Sir exams conduct chasthunaaa ledaa malli exams conduct chasthayaa 2 days before site lo pettadam khadu sir one week before chepali SBTET Sadan ga pettadam khaduu students Ki before one week chapalli sir…..
Any information about the C-14 3rd 4rt 5th 6th sem exam tell me anybody plz exams Malli peduthunara exams asaluu peduthunara ledaa tell me..
Meru chasina thapuu ki students daily 2 subject Rayadam ledu students jevitham anayamuu chayakandii sir! mee son or daughter ki Elanti situation vasthayaa appudu telusthadii sir!! Epatiki Aina change chayandi, (please change the time tabel) Students jevithalthoooo adukovaduu Okka C-14 m pappam chasindi sir! Did you have brain Sbtet( 3 rd and 5 th sem )( 4th and 6th sem) is time tabel is same dates timings is same place check update the new time tabel today last day if cont' change the time tabel court ki veluudayy…………….